Braun is a German maker of men’s foil-style shavers, and they’ve been in business since early last century. They’re considered the world’s #1 foil shaver brand. Their aim has been to manufacture well-designed shavers that provide a smooth, irritation-free shave for men, but that don’t cost a lot of money. The Braun Series 3 3040 men’s shaver is also built to be attractive, so you won’t have to worry about leaving it on your bathroom counter. The Braun Series 3 3040 men’s shaver is built in a plastic black and blue body, with a circular on/off button on the front center of the shaver. The Series 3 line of Braun shavers are meant to be affordable to everyone, and are at the lowest end of the scale. 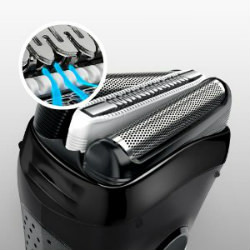 The other Braun shaver lines include CoolTec, Waterflex, Series 5, Series 7, and Series 9. 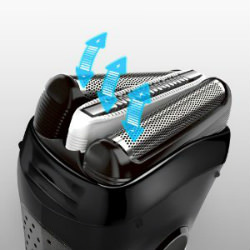 Besides a variety of other additional features in the Series 9 shavers, they also have a quadruple action cutting system, whereas the Series 3 has a triple cutting system. The Series 3 also doesn’t have the pivoting head or intelligent sonic technology, but you’ll find it still has a lot of the great features that all Braun shavers are noted for. You’ll still have the full washability and flexible cutting elements that are in every Braun shaver. 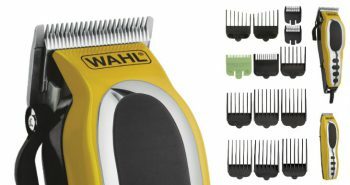 If you have the cash to afford the Braun premium lines go for it, but if you can only afford the Series 3, you’ll still be getting a great shaver. The Braun 3040 costs around $50, yet it does everything that you need it to do. 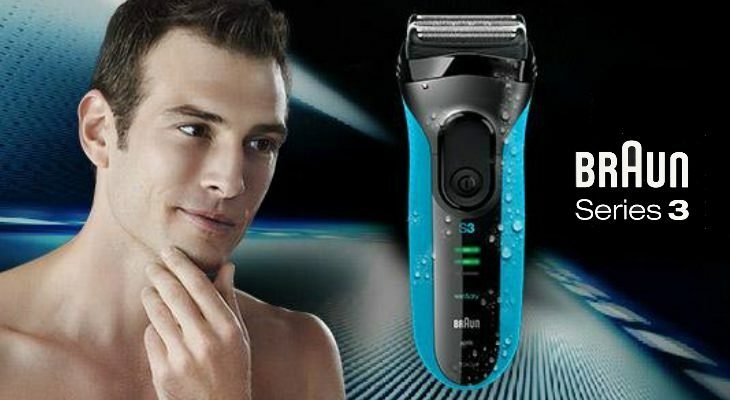 It is a cordless, electric, and rechargeable men’s shaver. It can also be used wet or dry, making it useful for shaving over the sink, in the bath or shower. The shaver can also be used with soap, gel, or foam, but it still works great should a man decide to use it only for dry shaving. This shaver is so great that the NFL decided to make it their official shaver. While this Braun shaver does have a silver-colored foil style head, it’s not like your basic foil you’ll see on other brands of shavers. If you tip the head to face you, you’ll see that there is a difference. The foils are actually composed of three different sections. The two end foils are the same, but the middle foil section resembles something like a zipper-comb. Braun calls this collection of foils a triple action cutting system. Each of these three foil sections will move independently of each other, floating and moving to a man’s facial contours. With three different types of foils, they will ensure that both long and short hairs get trimmed off with each stroke. Even three day old beards will be shaved off with a minimum of effort. Each of these foils is designed with micro comb technology. The hairs will get caught in the combs, as well as enabling for more hair to be lifted up before being snipped off. This Braun shaver is built with Sensofoils which were designed to minimize shaving rashes and burns. The Sensofoil provides an efficient but close shave through its optimized foil cuts. A man’s face will be left clean and smooth after shaving. 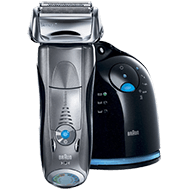 Braun makes the claim that this Series 3 shaver will out-perform its previous generations, for a better and faster shave. They have tested this theory on all previous Series 3 shavers to back up the claim. The Braun shaver was also designed with an ergonomic grip. 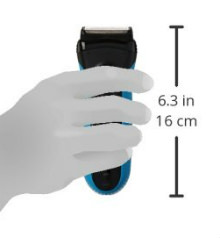 Each side has a rubberized grip zone which will enable you to more easily hold the shaver in your hands, and has been specially designed to be firmly held even when it is wet. 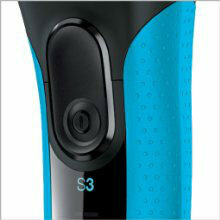 The blue part of the shaver is the section that has been rubberized. 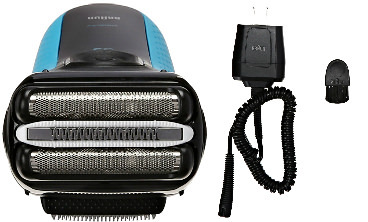 The shaver is also 100% washable so you can keep it in perfect running order. 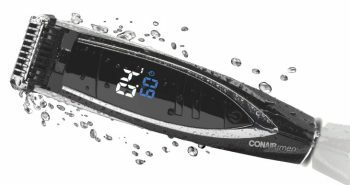 It can be submerged for up to five meters in water, so if you drop it in the bathtub it won’t be harmed. 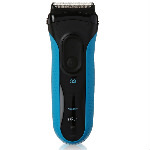 This Braun shaver has been built with a quality rechargeable Ni-MH battery. 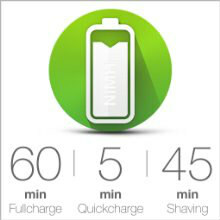 It will take only one hour to fully charge up, which will give you about forty-five minutes of shaving time. Should you forget to charge it up the morning before, and the shaver is completely dead, you can plug it in for a quick five minute charge. 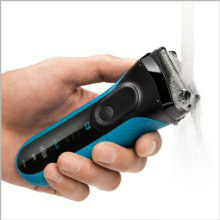 This will give you enough power to have your morning shave, but don’t forget to fully charge it up for the next day. 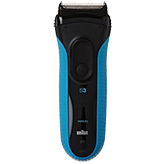 You can easily tell when your shaver does need to be plugged in for charging, as there is an LED display on the front of the shaver that indicates current battery level. This is displayed as a series of bright green LED lighted lines. When only one is left showing, it’s time to plug it in. 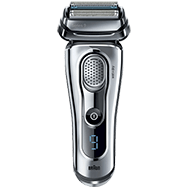 The Braun Series 3 3040 men’s shaver package measures 6.1 x 2.2 x 8.7 inches and weighs 13.6 ounces. 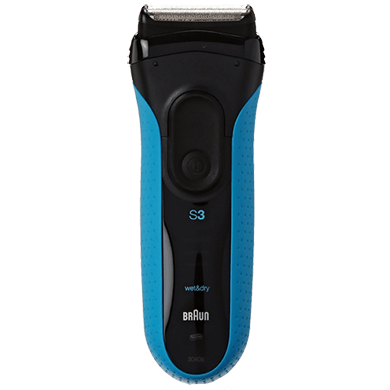 If you’re on a budget but don’t want to opt for a cheap no-name brand of shaver, the Braun Series 3 3040 men’s shaver is going to be your best friend. You’ll find that it gets the job done with maximum comfort, and you’ll still look your best for your upcoming day. Nick I am used to a Philips with 3 rotary blades. How does this cut in comparison when you move it around in a circular fashion , or can you move it in a circles or does it prefer straight back and forth movements due to the foil type of blade. Hi Peter. You have to move it straight back and forth all the time, and hold it in the right angle that is 90 degrees to your skin.